Having just completed reconstructing the storefront on our historic building, the Lyric Center for the Arts is moving forward on Phase 4 of renovating the historic Lyric Building in Virginia, MN! Our wildly successful children's theatre program has really outgrown their current space. It only comfortably seats 60. They are ready to move on! Phase 4 of the Lyric project will provide a 120 seat performance venue which will be home to Small Parts Players children's theatre company, area musicians for small venue concerts and recitals, and other performance needs. It will also be available to rent for other uses. 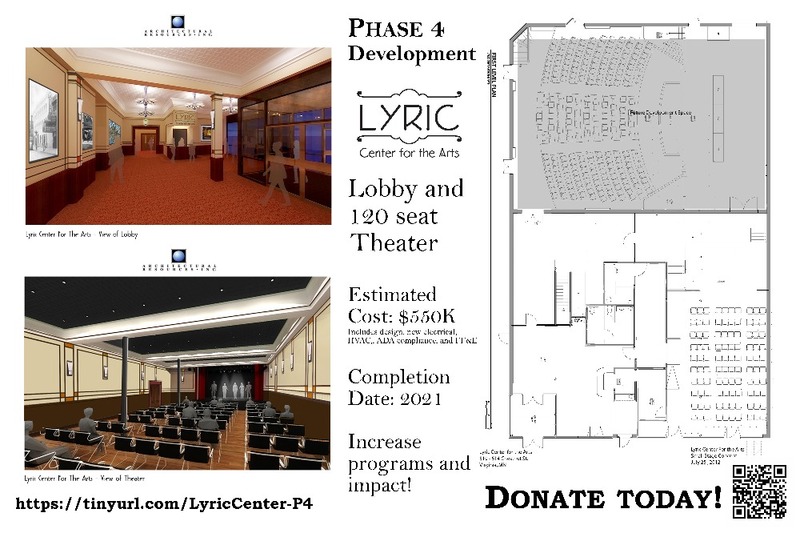 In addition, the grand lobby of the Lyric will be renovated and provide gallery and meeting space. The money you donate here will move this project forward. To date we have secured the building from deterioration with a new roof, created the area's only art gallery which has been operating since 2006, and reconstructed the storefront of the historic Lyric building on Chestnut Street in Virginia. The cost for the architect and engineering work will be approximately $50,000. Expected cost for the renovation will be $500,000. While we will be seeking grant funding, we hope YOU will be generous in your donation moving forward to provide a creative place on the Iron Range!